This canvas has been stretched in the best Belgian Medium Acrylic Primed Linen. Linen is a very strong and fine material that has a great natural texture. 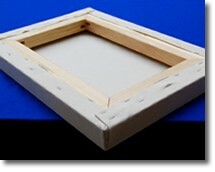 The canvas is ‘Hand Stretched’ on to the canvas frame, leaving a professional clean edge. Extra wooden supports across the canvas stretcher will be added if needed, to make the frame much stronger. This is to prevent the canvas warping in any way. This frame has a 6 window construction. This canvas is available from stock, so dispatch can be done within two days.